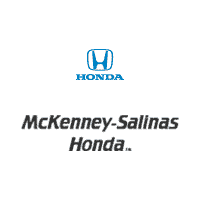 If you’re looking for a new compact SUV with a versatile interior and plenty of technology, then come to McKenney Salinas Honda. A new 2019 Honda CR-V CVT 2WD LX is ready to lease for $249/month for 36 months** with $2,300 due at signing (plus T, T, L). The comfortable interior accommodates up to five people unless you fold down the 60/40-split rear seatback so that cargo room jumps from 39.2 to 75.8 cubic feet. Cargo area tie-down anchors help secure whatever you want to carry. Set the temperature on the Automatic Climate Control System once and it compensates for changes in the weather outside. The multi-functional center console with sliding armrest acts as storage for things you want to keep close at hand. Backing up becomes safer with an assist from the Multi-Angle Rearview Camera with guidelines. The image appears on the five-inch color LCD screen. Check out the Multi-Information Display to view such operational info as speed, exterior temperature, and mile to empty. With the Radio Data System, you’ll know the name of the song and the artist. The volume of the music automatically adjusts to how fast you’re driving thanks to Speed-Sensitive Volume Compensation. The LX trim of the 2019 Honda CR-V relies on a 2.4-liter 4-cylinder with Direct Injection, Dual Overhead Cams, and Variable Valve Timing and Lift Electronic Control with intelligence. The result is 184 horsepower and 180 lb.-ft. of torque. Its Hill Start Assist feature holds the brakes momentarily when you start on a slope so you have enough time to move your foot from brake to accelerator without the SUB rolling down the incline. ** Lease for 36 months. Plus tax and all applicable fees. ​12,000 miles​ per year. For well-qualified lessees. Not all will qualify. Lessee responsible for excess wear and mileage. $0 security deposit. Must take dealer stock delivery by 04/30/19.